Identical twin astronauts, Scott and Mark Kelly, are subjects of NASA’s Twins Study. Scott (right) spent a year in space while Mark (left) stayed on Earth as a control subject. Researchers looked at the effects of space travel on the human body. Credit: NASA. The change related to only 7 percent of the gene expression that changed during spaceflight that had not returned to preflight after six months on Earth. This change of gene expression is very minimal. We are at the beginning of our understanding of how spaceflight affects the molecular level of the human body. NASA and the other researchers collaborating on these studies expect to announce more comprehensive results on the twins studies this summer. The Twin Study propelled NASA into the genomics era of space travel. It was a ground-breaking study comparing what happened to astronaut Scott Kelly, in space, to his identical twin brother, Mark, who remained on Earth. The perfect nature versus nurture study was born. The Twins Study brought ten research teams from around the country together to accomplish one goal: discover what happens to the human body after spending one year in space. NASA has a grasp on what happens to the body after the standard-duration six-month missions aboard the International Space Station, but Scott Kelly’s one-year mission is a stepping stone to a three-year mission to Mars. If the results of the Twins Study are like a play, Act 1 began at NASA’s Human Research Program (HRP) 2017 Investigators’ Workshop (IWS), where the ten teams presented their preliminary findings. Reports included data on what happened to Scott Kelly, physiologically and psychologically, while he was in space, and compared the data to Mark Kelly, as a control subject on Earth. The 2018 IWS is Act 2, where findings from 2017 were corroborated, with some additions. Researchers also presented what happened to Scott after he returned to Earth, again while making comparisons to Mark. Act 3 will be debuted later in 2018 when an integrated summary publication is expected to be released. By measuring large numbers of metabolites, cytokines, and proteins, researchers learned that spaceflight is associated with oxygen deprivation stress, increased inflammation, and dramatic nutrient shifts that affect gene expression. After returning to Earth, Scott started the process of readapting to Earth’s gravity. Most of the biological changes he experienced in space quickly returned to nearly his preflight status. Some changes returned to baseline within hours or days of landing, while a few persisted after six months. Scott’s telomeres (endcaps of chromosomes that shorten as one ages) actually became significantly longer in space. While this finding was presented in 2017, the team verified this unexpected change with multiple assays and genomics testing. Additionally, a new finding is that the majority of those telomeres shortened within two days of Scott’s return to Earth. Another interesting finding concerned what some call the “space gene”, which was alluded to in 2017. Researchers now know that 93% of Scott’s genes returned to normal after landing. However, the remaining 7% point to possible longer term changes in genes related to his immune system, DNA repair, bone formation networks, hypoxia, and hypercapnia. Increasing mission duration from the typical six-month ISS mission to one year resulted in no significant decreases in Scott’s cognitive performance while inflight and relative to his twin brother Mark on the ground. However, a more pronounced decrease in speed and accuracy was reported postflight, possibly due to re-exposure and adjustment to Earth’s gravity, and the busy schedule that enveloped Scott after his mission. 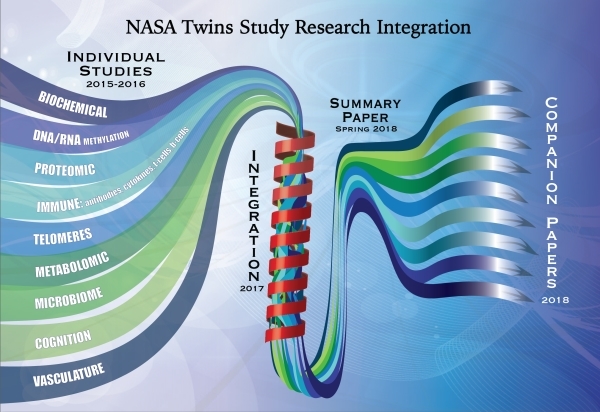 For additional detail on preliminary findings, visit NASA Twins Study Investigators to Release Integrated Paper in 2018. All of these findings are being integrated and summarized by the research teams; researchers are also evaluating the possible impact that these findings will have on future space travel beyond low Earth orbit. The next step for Twins Study investigators is Act 3, as referenced above. An integrated summary paper will be published later this year. A series of smaller papers grouped by related research areas will also be released. The Twins Study has benefited NASA by providing the first application of genomics to evaluate potential risks to the human body in space. The NASA Twins Study also presented a unique opportunity for investigators to collaborate, participating in a team approach to HRP research. Observations guide development of future hypotheses. Research from the landmark Twins Study will inform NASA’s Human Research Program studies for years to come, as NASA continues to prioritize the health and safety of astronauts on spaceflight missions.